Bring in the new year with good company, great drinks, tasty food, and a lively atmosphere. 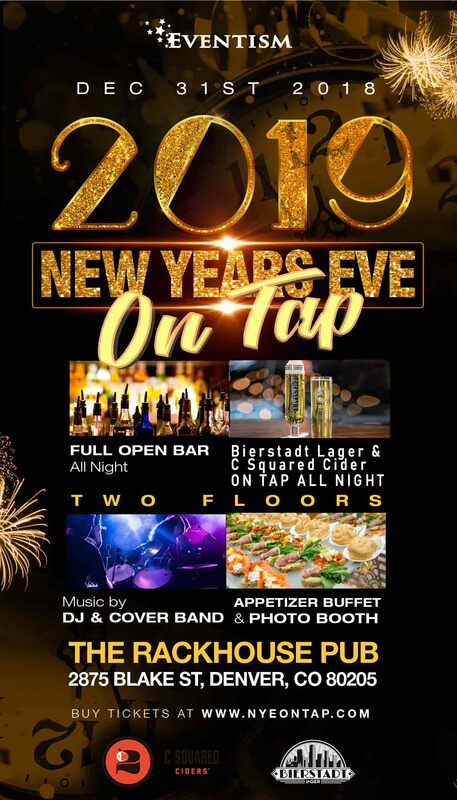 NYE On Tap, located in the trendy RiNo district, will give you a night to remember. Open bar on cocktails, plus unlimited beer and cider will be on tap from 9:00 p.m till 1:30 a.m. Indulge in a delicious appetizer buffet on both floors and for those looking for more, there will be 50 Ultra VIP tickets available. Say cheese at the photobooth but don't forget to grab your complimentary NYE party favors first. A giant balloon drop at the stroke of midnight will be one for the books. So grab some friends and family for a night of dancing and fun. You must be 21+ to enter this event, all guests will submit a valid ID at check-in. There will be limited scattered seating available. This New Year's Eve 2020 Event Will Sell Out! Doors: Doors open at 8 pm. Beer -Wine -Margaritas -Cocktails - Cider. Music: The DJ’s will be mixing the best of Top 40, EDM, Dance, Pop, Hip-Hop/Soul. Seating: Scattered seating will be available. There is no reserved seating. Parking: Complimentary parking lot and off street parking. Check-In: Must have a valid photo ID to check in. This event is 21+. Coat/Purse Check: A Coat check will be available for $5 per item. ATM Machines: located inside the venue.